Gravity: Blog Tour Review and Giveaway! 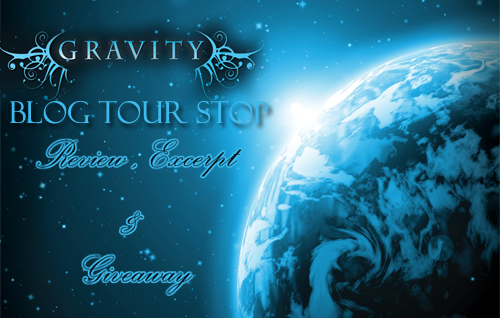 Welcome to my stop on the Gravity Blog Tour hosted by Shane @Itching for Books. I was a little confused in the beginning. There were too many details but not enough explanation but don’t give up on the book. Read on, it does get better. Once the story picks up there is no looking back. I got the book quite late for the tour and wasn’t really sure that I could do a review but once I started reading I was hooked. I needed to know what happened next and I need the next book in the series NOW!. Ahh……the ending. I have so many questions. Please Melissa, if you could send me the next book too I will be forever in your debt. I can’t stand not knowing!!! Okay, enough with my drama. Let’s talk about the characters. I loved Ari. She is smart, self-less, caring, kickass, so in short, she’s awesome. I am a little picky when it comes to female protagonists. I generally hate them and the whole “damsel in distress” stuff just gets on my nerve. So it’s refreshing to read about girls that can fight for themselves. Ari cared about people, even strangers. She risked her life to save them. How can you not like her? I thought that she made a brave choice when she decided to help Jackson and go against everything she believed in order to avoid a war that will just lead to destruction and loss of lives. I was really angry at Ari’s dad and Cybil. They were so arrogant that they refused to see reason. They are complex characters and hopefully in the next book we will see a softer side to them. Jackson is an ancient. Humans are not allowed to see ancients but Ari sees him and it turns out that he needs her help to save humanity but for that she has to tell him secrets and lie to her father. Jackson was sweet, cute and totally swoon worthy. I think I have a crush on him. He genuinely cared about Ari and I am a little ashamed to say that I doubted him a little but I guess that just proves how invested I was in the story. I liked Lawrence too. He was a great friend and so was Gretchen. All the characters are well developed. I am excited to learn more about Zeus, who is the leader of the Ancients. I think he will quite a complex and interesting character. The plot is different and unique. Though I did feel that the romance was rushed. Ari fell for Jackson too soon. I liked the story, the characters and the writing. I definitely recommend it. READ IT!! Coach Sanders, our seven-foot, balding instructor, is standing beside the aerial mat. Aerial boxing is the one form of training in which size has no bearing. It’s all about speed and balance. Those who can control their bodies, win. Those who can’t, face plant on the mat. I’ve been in both positions. I scan the crowd to find Jackson sitting on the ground. As the two top seeds, we’ll fight until the Engineers feel one of us is superior to the other. He spots me and winks. Fury lights up inside me, and I almost rush over and demand that he answer my questions. Instead, I stand my ground. It’s like I’m hunting an animal and have to be still so I won’t startle it. If only I didn’t have to wait until tonight to get answers. Something Wicked Comes: Blackbrooke: Guest Post and Giveaway! This book has been on my wishlist for such a long time, so I'm sooo excited it's finally coming out!! I am very intrigued by this book. LOVE the concept of Aliens, although I have not read many books about them. Maybe this or the Lux series will be a good start. I wish the giveaway was international, but great post, by the way. that book sounds awesome!! can't wait to read it. 😉 great review! I love this concept. I'm all about sci fi stuff! Lux series, and the I am Number Four books have really gotten me onto alien type books, so this one sound like its perfect for me. I think it sounds awesome. This book sounds really intriguing and different than the books I've been reading so far. I'm excited aliens are popping up as characters in some books lately! Very cool!